Metro Transit emphasizes accessible, public transportation that fits into the communities it serves. The A Line serves the busy corridor of Snelling Avenue, Ford Parkway and 46th Street. These A Line stations will serve as a model for future BRT stations located in 11 other metro corridors across the region. 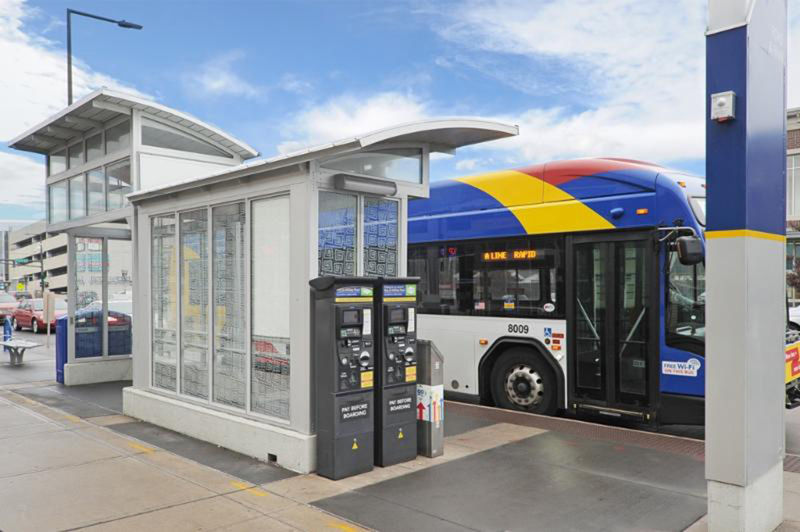 “Duo-Gard’s team collaborated closely with Metro Transit to achieve the customer’s goals,” said Kevin Chown, Duo-Gard’s sales manager for outdoor structures. She added, “Along with the high performance of an anodize finish, the clear color also highlights Duo-Gard’s aluminum construction for a clean, contemporary aesthetic.” Further accentuating the modern, metallic appearance, the curved, standing-seam aluminum roofs are complemented by corrugated steel panels on their undersides. The shelters are sized in small, medium and large, ranging from 7 by 17 feet to 7 by 40 feet, and are installed according to site conditions and ridership patterns. The signage pylons accompanying the shelters are 13 feet high, 24 inches wide and 8 inches deep. In addition to contributing to Metro Transit’s branding with a custom logo on top, the pylons provide real-time information and serve as a beacon for riders. The station platforms integrate fare collection machines, transit signal priority and security elements, as well as push-for-heat buttons and plates, and edge-lit LED map cases. All of the electrical wiring is concealed inside the finished aluminum framing. Duo-Gard first demonstrated this engineered frame design in plastic, as a 3-D printed corner column. “Our ability to design the column and then print it in actual size enabled all involved to visualize and finalize this important element,” noted Chown. Brought to life in finished aluminum, the framing members feature narrow sightlines and maximum viewing areas. Duo-Gard also developed a new T-extrusion for glass retention to meet this architectural element and the design team’s intent. 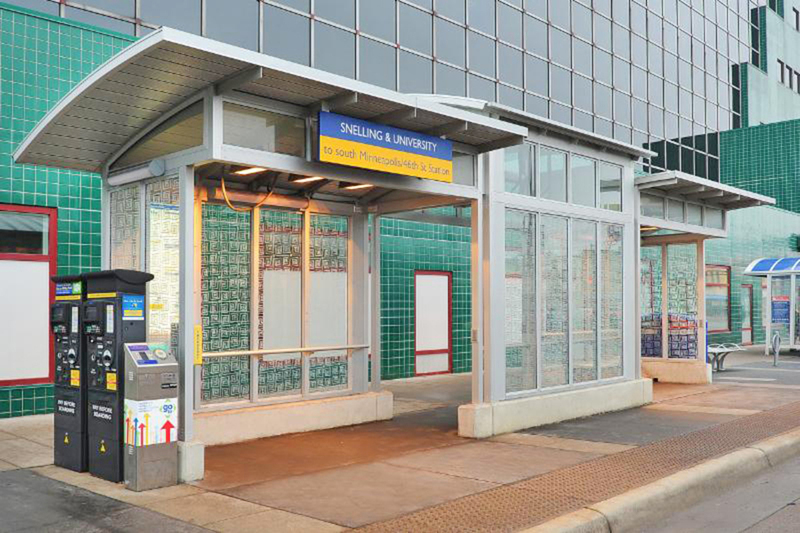 Working with Metro Transit, Minneapolis-based Luken Architecture created the concept for the BRT shelters as part of an overall design team led by Kimley Horn and Associates, Inc. More than 1,000 riders also contributed to the design by stating their preferences for improved appearance and functionality. Opened June 2016, the A Line is the first of a dozen planned BRT routes that will serve core arterial streets, strengthening Metro Transit’s most-used routes. The A Line offers up to 25 percent faster service because the buses make fewer stops, and riders purchase or validate their fares before boarding. Buses pick up and drop off passengers at stations placed every half mile with a high frequency to speed service and connect customers to major destinations. The A Line now serves 4,500 riders each day. The stop at Snelling and University is among those reporting an increase of 32 percent. Following the success of the A Line, the Metro Transit C Line is scheduled for construction this spring. “The entire Duo-Gard team is proud of the A Line’s success, and we’re eager to begin work on shelters for the new C Line,” concluded Chown.